Navy blue tanktop, royal blue vintage blazer, grey jeans, and white sandals. Because it's extremely HOT here in Jakarta. It's like 30˚celcius over here! This question reminds me of my mom's credit card bill. Shoot! Surfing on a Rocket - Air. 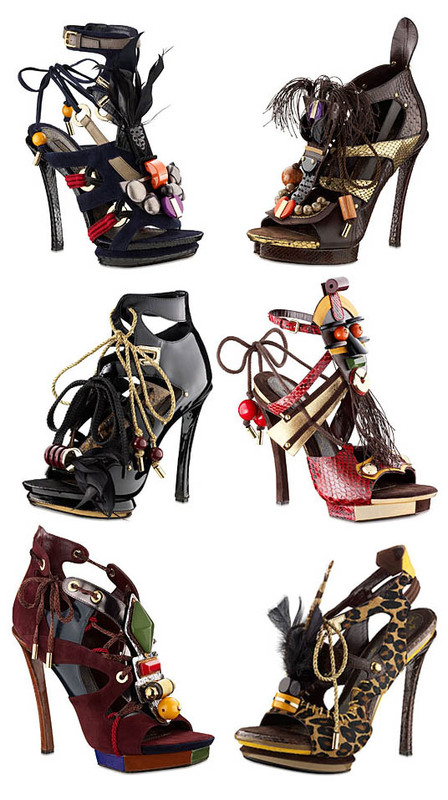 Louis Vuitton Spring 09 tribal shoes. what would you like to get rid of? Statistic and psychometric classes! BLAH!! Karl Lagerfeld, John Galliano, et Carine Roitfeld. Britpop, Triphop, Alternative, and Reggae. Still, fashion journalist and/or working for a Modelling Agency somewhere in Europe or US. Anything as long as it's fashion-related, that's my dream job. Gia Carangi, Sasha Pivovarova, Irina Lazareanu, Freja Beha, Bruna Tenorio, Chanel Iman, etc. John Galliano, Karl Lagerfeld, Miuccia Prada, Alexander McQueen, Dominico Dolce et Stefano Gabbana, and now Christophe Decarnin. Too much layers. Especially if you live in tropical country like Indonesia. It's just like too much going on. Bien sûr. I admire Kate Lanphear and fashion bloggers's style sooo bad. This is such a stupid question I guess. Who on earth don't admire someone else's style? 1. respond and rework: answer the questions on your blog, replace one question that you dislike with a question of your own invention, add one more question of your own. (disclaimer: i don't do this, because i don't know how to answer my own question, and can't even think of one right now). It seams like the Q&A of WAD Magazine Girls Issue. quite cool though! Love to know a lil more about bloggers! kak chekka.. hehe great answers! i'd rather go naked than wearing a pair of ugly shoes.. hahaha what a shoe fetish you are.. hehehe thx iah.. so glad u wanted to do this..
Week was super crazy last week, but I'll reply to your tags this week, PROMISE! The dress in the last photo is not really muscular. I like it and it is a wonderful choice for professional female.You can add a little female feeling with a scarf if you like.